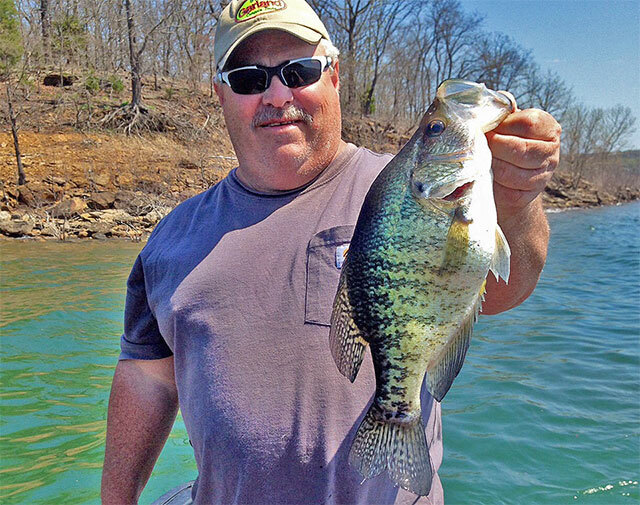 As the end of winter approaches, many anglers begin to think about spring crappie season. After all, as springtime arrives in full force and water temps warm into the low-to-mid 60s, crappie will begin to move shallow and get active with their annual breeding activities. By the time water temperatures have actually moved into the mid-60s and on up into the lower 70s, these springtime papermouths will be right up next to the bank, spawning in six-feet of water or less. And as you might expect, that can draw an angling crowd on a good lake or reservoir. Especially since such days are the times most crappie anglers spend all winter dreaming about. The time of the year when a lightweight rod-and-reel and a supply of either minnows or brightly colored jigs can both work their magic and produce consistent limit catches of big and tasty slabs destined for a hot fryer bubbling with peanut oil. But as good as the spring fishing for sac-a-laits can be, that doesn't mean that an angler should merely sit around by the fireplace and wait until spring officially gets here. Because to do so – especially with the mild winter the Midwest is enjoying this year – could cause an angler to miss out on some superb crappie fishing. Why is that? Because before slabs go into spawning mode, they'll first be staging in water lying next to their traditional nursery areas. "They will generally begin to get to areas of deep water adjacent to these historical spawning areas in late winter," explains Kurt Kuklinski, a supervisor and fisheries biologist for the Oklahoma Department of Wildlife Conservation's Fishery Research Lab in Norman. As crappie begin to stage near their spawning spots, they'll often do so in very tight bunches just about anywhere that an angler can find deeper water close to shallower water. And that can be especially true where a change in bottom composition happens to occur. "They will often suspend in 12 to 15 feet of water over 20-foot depths,” said Kuklinski. "As the water warms, they will progressively move shallower toward the spawning flats." The Oklahoma fisheries expert noted that either minnows or lead-headed jigs – in either 1/16- or 1/8-ounce sizes tipped with 2-inch Sassy Shads or Mister Twister curly tail grubs – will lure pre-spawn crappie to strike. And so will small crappie-size tube jigs, so keep a supply of those handy too. According to Kuklinski, a key consideration from the pre-spawn until the end of the spawn is this: If an angler isn't finding active fish, they aren't in the right spot. "February/March is about the time people can start seeing fish on (their) locators," said Kuklinski. "Big schools of suspended fish (can usually be found now)," he added. "When you start catching them (at this time of the year), they are tightly schooled and really bunched up." Meaning that where there's one willing to bite, there should be even more in close proximity. "The more productive crappie anglers don't spend a lot of time over a school if they are not catching them," said Kuklinski. "If you don't catch anything in five or 10 minutes, then move on to find active fish. "But if you start catching one or two fish, and they are bunched up really well, you can pull a lot of fish out if you have the right lure." As is the case with most forms of spawn-season fishing each spring, the water temperature on a particular body of water is a prime consideration. "The areas to key in on are areas where the water is going to warm up faster – something that gets a lot of sun exposure like the north side of some of the coves," said Kuklinski. How important is the water temperature for staging crappie in late winter? Extremely important says the biologist, noting that even just a degree or two in temperature difference can make all of the difference in the world. "Any area that warms up faster but has deep water adjacent to those areas, you're more likely to find these schools staging outside of those areas," said Kuklinski. The time to get after these tasty panfish is finally at hand. Because while the springtime crappie spawn gets all of the headlines each year, some of the best fishing on the annual calendar is actually now and not later.